answers this question: What is your favorite comfort food? 2. Leave me a link to your blog or email so I can contact you in case you win. Hi all=) Yes, another contest i've decided to partake in this month. This will be my second time doing an Iron Cupcake Earth Challenge. My first Iron Cupcake Challenge Ingredient was Basil. I didn't win that challenge and i'm just hoping for the best with this one- but, regardless if I win or not, I enjoyed making these cupcakes! I hope some of you have also entered in this challenge too- its a great way to experiment with ingredients you wouldn't otherwise think of trying (although berries are much more common to use than some of the other ingredients they've chosen for the other challenges). The other benefit of joining this is the networking! 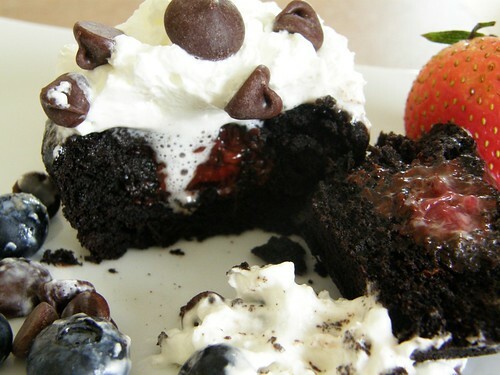 I called it Chocolate Berry Surprise because I dipped fresh berries (blueberries, raspberries, and strawberries) in dark chocolate and placed them in the middle of each cupcake. 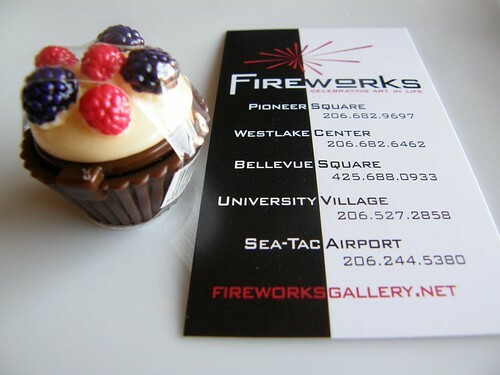 The cupcake either had one type of berry or a variety- so it was a surprise to the person who ate it. The cross section photo was taken while the cupcake was still warm so the whipped cream was melting onto the center. 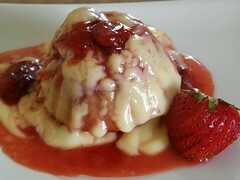 It is- and was VERY delicious. This won't be the last time I make it i'll tell you that=) Recipes for both these cupcakes will follow towards the end of the post if your interested. Last and certainly not least, the corporate prize providers for Iron Cupcake: Earth: HEAD CHEFS by FIESTA PRODUCTS, HELLO CUPCAKE by Karen Tack and Alan Richardson, JESSIE STEELE APRONS; TASTE OF HOME books; a t-shirt from UPWITHCUPCAKES.COM . Iron Cupcake:Earth is sponsored in part by 1-800-Flowers . Voting starts June 28- July 6. 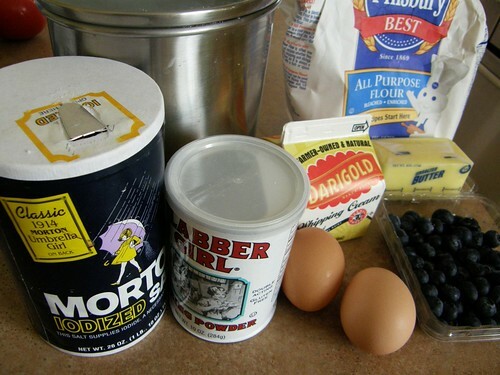 Before I made the cupcake batter, I got the berries ready. 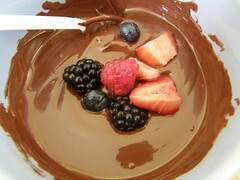 Melt the chocolate in a microwave safe bowl and heat it up in 20 second increments, stirring it often to disperse the heat & have it melt equally. It looks ready, now drop the berries in and get ready to fish! Actually, I recommend doing 3-4 at a time because it gets really clumpy when you put too many in at once. You'll see later. Pretty messy, but so worth it. 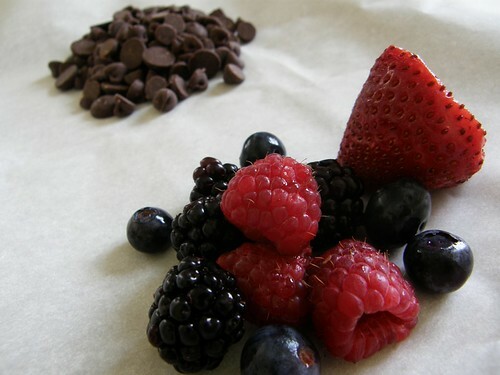 Place the berries on parchment paper and them place them in the refrigerator to cool and harden. You see that huge clump on the bottom left? I put too many in at once. 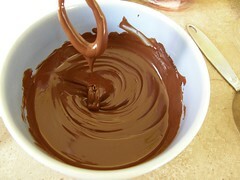 The chocolate cooled too fast and it started to get too thick. I didn't want to place it in the microwave to warm it again because the berries were already in the chocolate and they were too fragile. 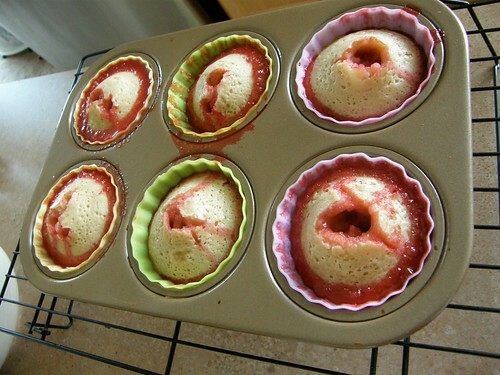 So while that is cooling, you have time to make the cupcakes. 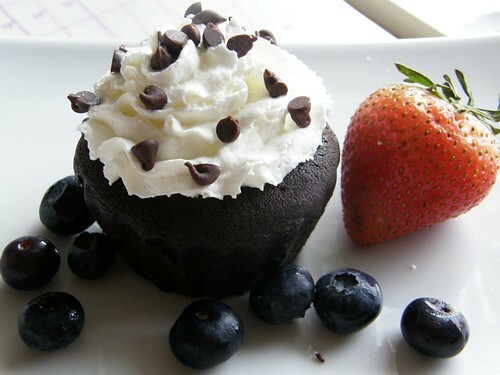 For the Chocolate cupcake, I used Martha Stewarts version of her Classic Chocolate Cupcake. I changed one thing since I didn't have the regular unsweetened cocoa powder. 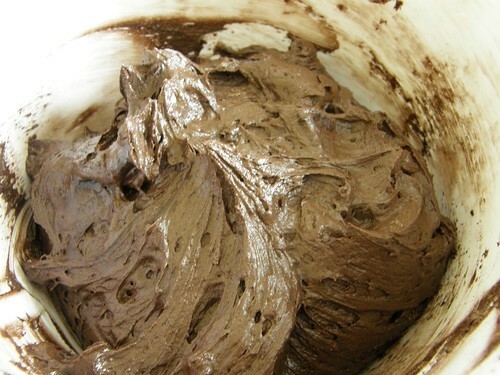 Instead, I used Hershey's Special Dark Cocoa Powder. 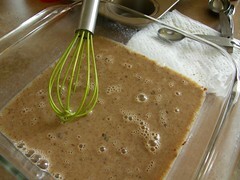 Into a medium bowl, sift together cocoa, flour, baking powder, and salt; set aside. 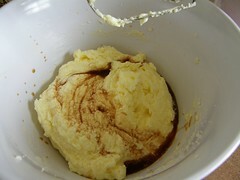 In a mixing bowl, cream butter and sugar until light and fluffy. Add eggs, one at a time, beating well after each, then beat in vanilla. 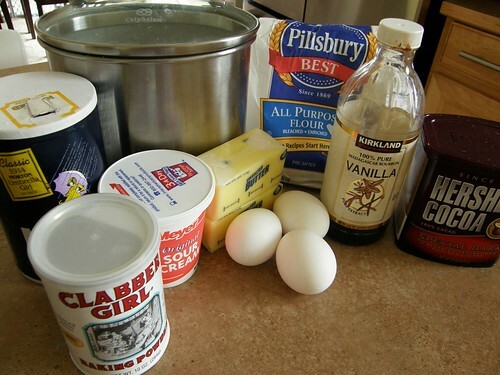 With mixer on low speed, add flour mixture in two batches, alternating with sour cream and beginning and ending with flour. Cool in pan 5 minutes; transfer to a wire rack to cool completely. Use any topping you desire, but I used whipped cream out of the can and topped it with chocolate chips. 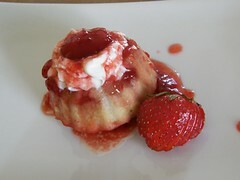 I found this recipe browsing online and stumbled upon the blog Cupcakes and Crinoline. She found the recipe through Gail Wagman's Cupcakes Galore book. 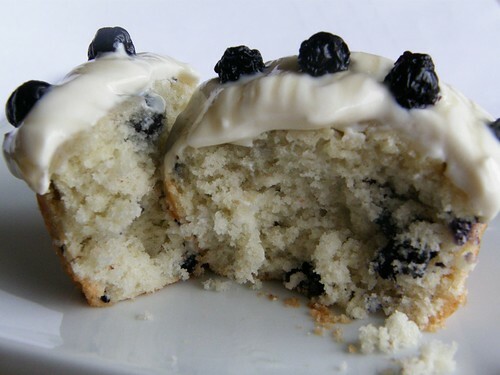 I am so glad I found it because this recipe is a winner as well. 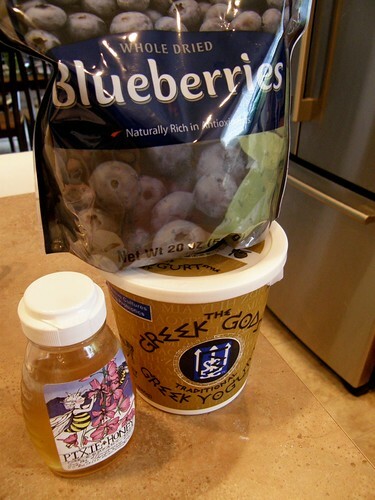 I am going to try to substitute the blueberries for strawberries next weekend. We'll see how well that turns out. Preheat oven to 350°. 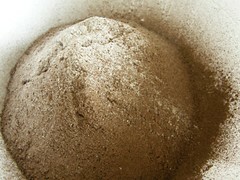 Mix flour, baking powder, and salt together and set aside. 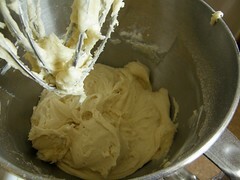 In large electric mixer bowl, cream together butter and sugar until light and fluffy. Add eggs, one at a time, beating well after each addition. 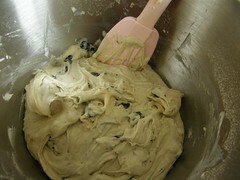 Alternately, add dry ingredients and milk or cream. 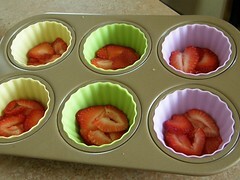 Spoon batter into cupcake papers, filling cups about 2/3 full. 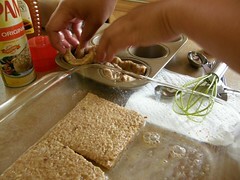 Cook for 20 to 25 minutes or until a tester inserted into the center comes out clean. Remove from oven and cool. **Keep an eye on it, make sure to check it after 20 minutes don't expect the tops to be browned, just check for doneness. Mine baked until 24 minutes and it was perfect**. 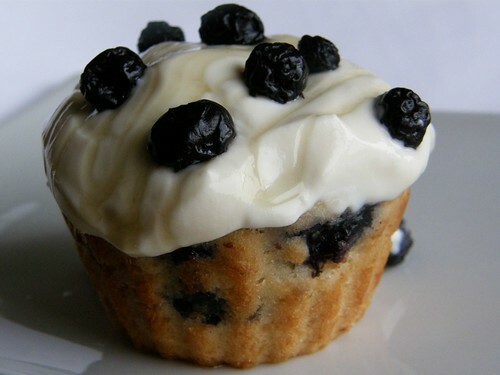 Make some today, they are both really yummy cupcakes. I wouldn't enter if they weren't. Feel free to message me if you have any questions or need any clarification. 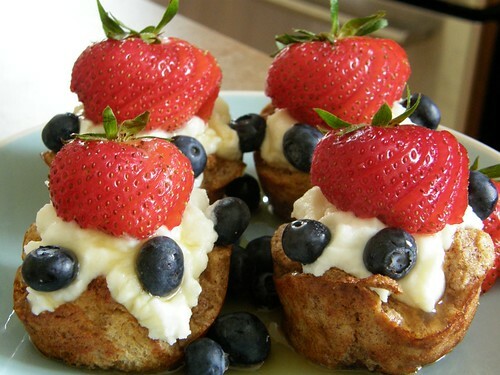 This month's Iron Cupcake challenge is Summer Berries. I had a couple of mishaps as I mentioned in my previous blog about one of my potential cupcake entries. 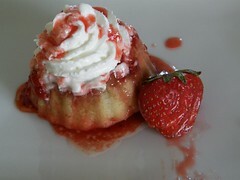 I was going to do an Upside Down Strawberries & Champagne cupcake, but that didn't turn out as planned. I was rushing and it turned into one hot mess! It was also totally experimental. It looked good when I was preparing it before it went into the oven. Lets take a look shall we? Sliced fresh strawberries, they look so good! I should have stopped then and there, but nooooo~ I wanted to take it further. "Lets try to make it work" I think to myself. "It might actually taste good". Ummm....are you ready? Barf. Hmmm...how about a different topping? I give up on this cupcake. This next picture isn't actually all that bad. So I tasted it. Yuck. It was the cupcake batter. The strawberries with the champagne tasted wonderful. The cupcake batter was just horrible. Scratch that idea. 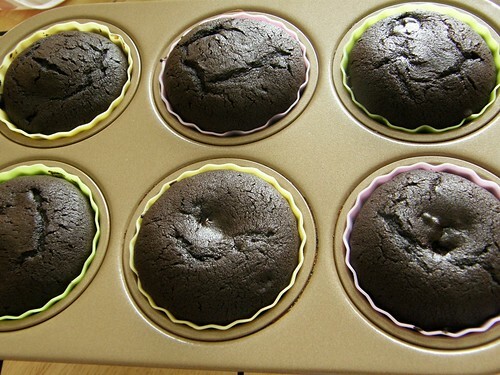 Oh, I forgot to mention that the batter made 18 cupcakes, but I only baked 6 in my cupcake pan. 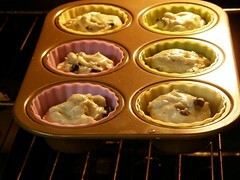 The rest I put them in little cake pans- put it about 3/4 full- it overflowed out of the baking pans! My oven was getting all smoky and so was the house. Oh my goodness it was just a disaster. I didn't have time to take pictures. I had to take out the pans throw them into the sink and start cleaning the inside of the hot oven so it didn't get so smoky inside. Never again. Okay, maybe sometime in the future I will try it again and find the perfect recipe for it- but for now, i'm gonna have to pass on that. I had a few extra cupcakes from my "Iron Cupcake Trials"- they turned out pretty good, but I have one more recipe that I have to try out before I post it. In the meantime, here are 2 book characters that I decided to try out painting. 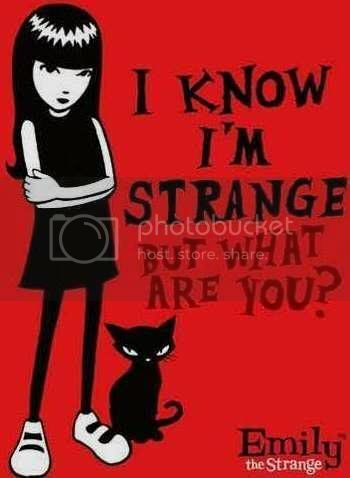 Olivia the Pig & Emily the Strange. This is my first time using petal dust and color gel + lemon extract to paint on fondant. I'm sorry I couldn't take more pictures or do a whole tutorial for this as it was my first time and i'm certainly no pro at it. But, here is one picture that shows you in a glimpse how I did it and what tools I used. I am working on doing the Hoops & Yoyo tutorial because a reader from Sweet Cuppin Cakes Bakery blog requested it. 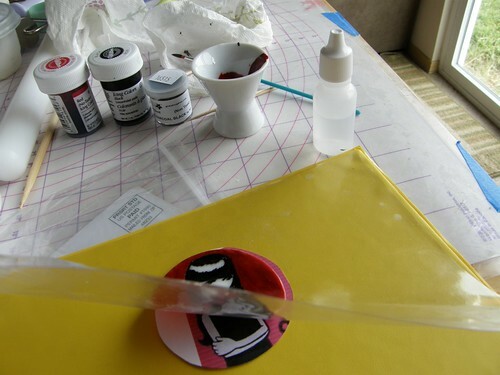 Painting on fondant takes a lot of time- i'm glad I picked book characters that used only 2 colors! I have my one year old to watch, so its difficult to try to work fast and at the same time take good photos that explain what i'm doing. I have to save that for the weekends when my husband is home and can watch our baby. Tutorials will be coming up though~ just keep checking back. 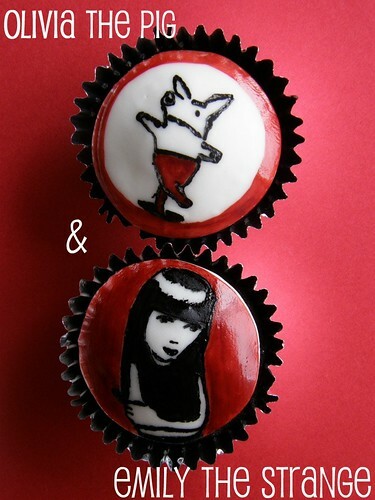 Visit their websites Olivia the Piglet & Emily the Strange. First, I just want to thank all of you for your votes on the Ice Cream Cupcake Roundup~ whether you voted for my cupcakes or not. I really appreciate you just stopping by here. I am over-the-moon ecstatic that I have more readers and subscribers to my little food blog=) The winners have been posted and you can visit Scoopalicious for the results. I will definitely try again next year and I hope you will too! It really is fun trying to incorporate different themes into a cupcake- that's why i'm going to do the Iron Cupcake Challenge this month too. 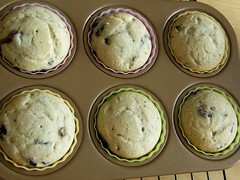 (I'm still not done, I had a few mishaps- i'll fill you in when I do my Iron Cupcake post). 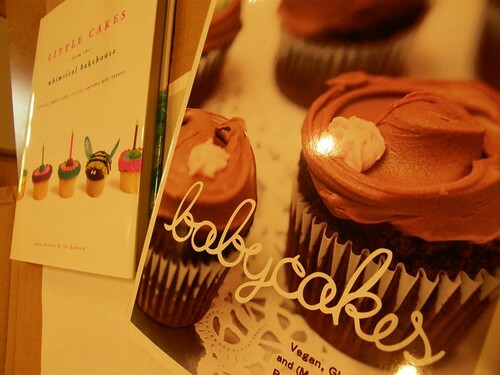 I purchased: Little Cakes from the Whimsical Bakehouse and Babycakes!!! I have yet to try any of the recipes/techniques on either books, but I will definitely post about them when I do. If I am totally in love with either book, I will definitely think about doing a giveaway, but in the same effect, I don't think I have that many readers/subscribers to do one- and I can only send out the prize in the U.S. ( I would love to send it to other countries but it would be way to expensive for me as I will be purchasing the prize and mailing it out too- but I really do appreciate my readers from all the different countries). Tell you what, if I get at least 100 subscribers, I will giveaway one of the two books. This will probably take awhile, so if you can't wait, you can by the books here and check out all the other books I keep in my kitchen cabinet=). Now are we ready to bake & eat? Summer is just around the corner (June 21st to exact) and its that time of the year where people try to eat a little less and exercise more. This year I am one of those people. I am turning 30 this November and I want to lose some poundage okay, a lot of poundage. 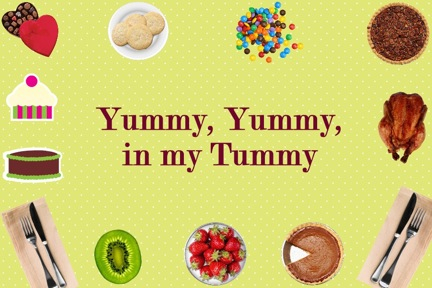 Not so easy with a food blog, but I have found some great recipes! Just yesterday I was browsing around on the DVR and wondered what this show Cook Yourself Thin was about. I watched all 9 episodes because I was so intrigued. I made one of their recipes for breakfast today. Okay, lets go! 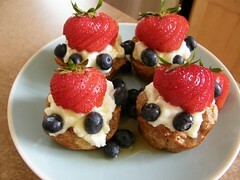 **(as you can see, I substituted my berries for blueberries & strawberries). 2. In a bowl, whisk together the egg, egg white, milk, cinnamon and honey. 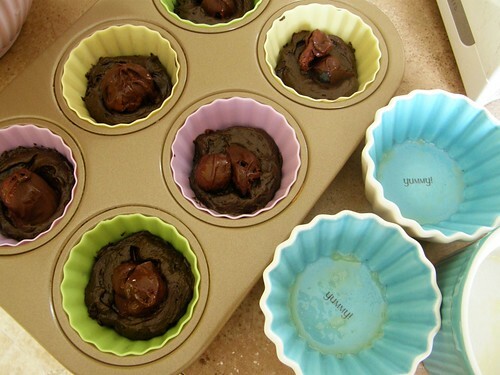 Spray a nonstick muffin pan with calorie-free vegetable spray. 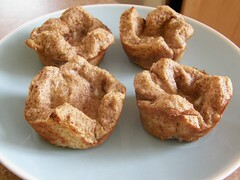 Carefully dip each slice of the bread into the egg/milk mixture and press it into the muffin pan. Bake at 375 degrees for 12 minutes, until crisp. 3. Meanwhile, in a small bowl, mix together the ricotta cheese until smooth. 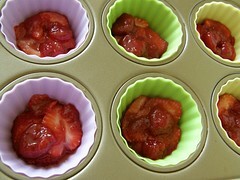 Spoon equal amounts of the ricotta mixture into each of the bread cups and top with berries. Drizzle the maple syrup on top. 353 Calories for 2 of these yummy things. **I only used 1 tablespoon of maple syrup to drizzle on all 4 of the sundaes. 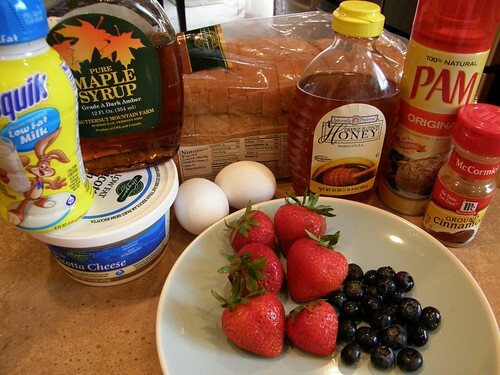 I love sweets and would have liked a more syrupy taste with my ricotta cheese, so next time, I am going to use 1 tablespoon of the syrup and mix it into the ricotta cheese before putting it on top of the french toast. If I still feel like it isn't sweet enough, i'll add the remaining tablespoon of syrup on top. 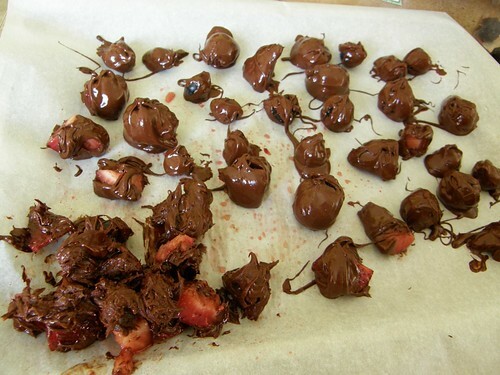 I hope you try these, they really are delicious, tasty, and healthy! ** Please come back and visit again because there are more recipes I would love to try from the show! Happy Eating! It's got me all giddy- i'm grinning from ear to ear! (It's an old photo of me. 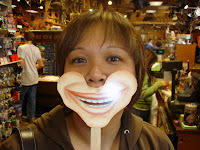 I was shopping at Ye Old Curiosity Shoppe in Seattle and saw this smiley face thingy. 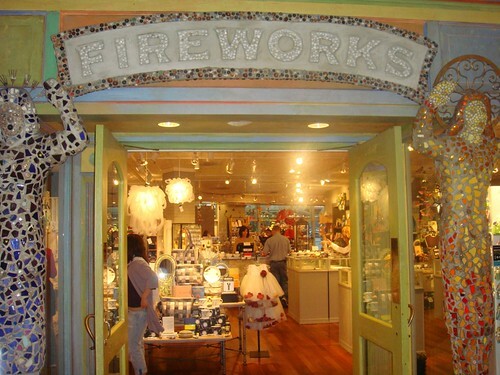 It's a really neat store. Next time your in Seattle, I suggest you stop by)! Another post will be up soon! 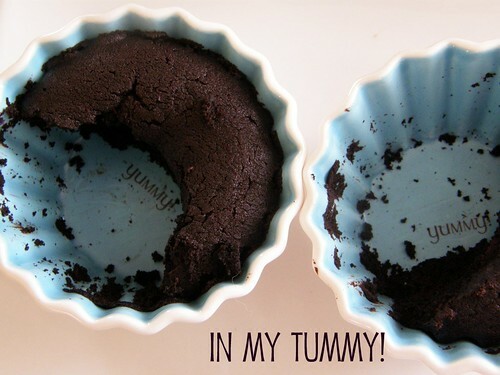 I am entering in this month's Iron Cupcake Challenge, come back and see what i've created!